Cairns Airport is one of the leading regional airports in Australia. The airport has direct flights to the Gold Coast, Brisbane, Melbourne, Sydney, Darwin, Townsville, Perth and Adelaide. Cairns Airport also handles direct flights from Hong Kong, Tokyo, Osaka, Port Moresby, and Guam, as well as seasonal flights to Auckland, Shanghai, and Guangzhou. There are two passenger terminals at Cairns Airport - the international terminal (T1) and domestic terminal (T2). The car hire counters can be found at the Arrival Hall of both terminals. Click here for a map of the airport. Car hire companies at Cairns airport include Avis, Budget, Hertz, Europcar, Thrifty, and Enterprise. Compare the latest rates, car models, transmission types, seating capacity, and more. We'll help you compare top brands to find a car that suits your needs. Indicate when you want to pick up your car hire, specify your pickup and drop-off locations, and start your search now! Why hire a car at Cairns Airport with VroomVroomVroom? Great rates - We compare rental cars from Budget, Avis, Europcar, Hertz, Thrifty and Enterprise to bring you the best price. Check out our price promise to find out how you can get a great deal. Pick up a car direct from the airport - Have a peace of mind knowing that a car is waiting for you when you arrive at the airport. Just get your keys and you're on your way! Wide selection of cars - Aside from having a wide range of rental cars to choose from, we also compare campervan hire deals in Cairns. Great service - When it comes to customer assistance, our highly-motivated customer care experts are ready to assist you. We have been helping customers book a rental car since 2001. Contact us today! You can also reach out to us via Facebook and Twitter​. The airport is nestled between the east of Trinity Bay and the west of Mount Whitfield. It is just seven kilometres away from central Cairns. Cairns Airport serves as a gateway to the Great Barrier Reef and North Queensland's tropical rainforests, making the airport quite popular among outdoor lovers and explorers. Before driving your car rental or campervan hire, it is advisable to check the weather forecast in Cairns at WeatherZone so you can plan your itinerary better. Is it your first time travelling in Australia? If you want to learn the rules of the road, you can check out this informative article. Appropriately and ideally situated just 10 minutes from the CBD, 25 minutes from Palm Cove and the Northern Beaches, and nearly one hour from Port Douglas, flying in and travelling to Cairns is easy and hassle-free as many domestic and international flights arrive every day. Cairns is known as the heart of the Tropical North as well as a magnificent base for touring this large region. The Great Barrier Reef serves as the perfect destination for tourists. Other places that you should visit include the breathtaking Daintree Rainforest, Cooktown and Cape York to the north, the impressive Tablelands and outback to the west. 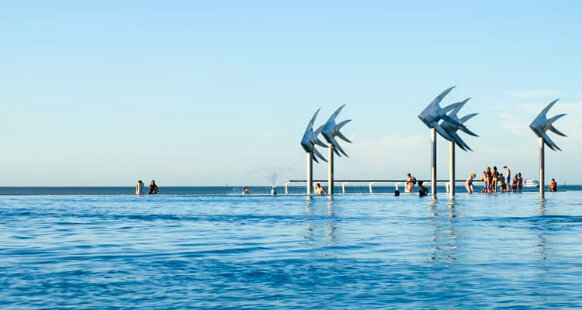 Aside from a variety of top attractions and cool activities to select from, there are other great reasons why you should visit Cairns - from the beautiful beaches and marvelous hinterland to the amazing cafés and bars, lively markets. Take pleasure in diving and snorkelling at the Great Barrier Reef. Sail to Green Island and snorkel straight off the beach. Have a road trip to Port Douglas and visit the Sunday markets. Enjoy a glorious scenic hot air balloon flight over the Atherton Tablelands. Take a scenic rail & skyrail ride to Kuranda. Explore the world's oldest surviving tropical rainforest in the Daintree. Go rafting on the mighty Tully River, known as the best rafting river across Australia and New Zealand. See some Spanish-style castles at Paronella Park. Indulge in fresh local produce straight from the farms at the Atherton Tablelands. Adore coral gardens and secluded beaches at Fitzroy Island. Drive through north of Cairns and visit Cooktown, regarded as one of Australia's most historically momentous townships. Feedback: We always book with Vroom Vroom - it is just so easy and always gives us the cheapest option. Feedback: Insurance coverage is not easy to understand. Feedback: simple and great price ! Alamo Cairns Airport Terminal 1 Intl - Serviced By Enterprise Redspot Terminal Building Airport Ave, Cairns, QLD. Alamo Cairns Airport Terminal 2 Domestic - Serviced By Enterprise Redspot Term Building Airport Avenue, Cairns, QLD. Avis Cairns Airport - Terminal Building, Cairns Airport, Cairns, QLD. Budget Cairns Airport - Terminal Building, Cairns Airport, Cairns, QLD. Europcar Cairns Airport - Terminal Building, Cairns Airport, Cairns, QLD. Enterprise Cairns Airport Terminal 2 - Terminal Building, Airport Avenue, Cairns Airport, Cairns, QLD. Enterprise Cairns Airport Terminal 1 - Terminal Building, Airport Avenue, Cairns Airport, Cairns, QLD. Hertz Cairns Airport - Airport Avenue, Cairns, QLD. National Cairns Airport T1 Intl - Serviced By Redspot Enterprise Terminal Buildinairport Avenue, Cairns, QLD. National Cairns Domestic Airport T2 - Serviced By Redspot Enterprise Terminalbuildingairport Avenue, Cairns, QLD.